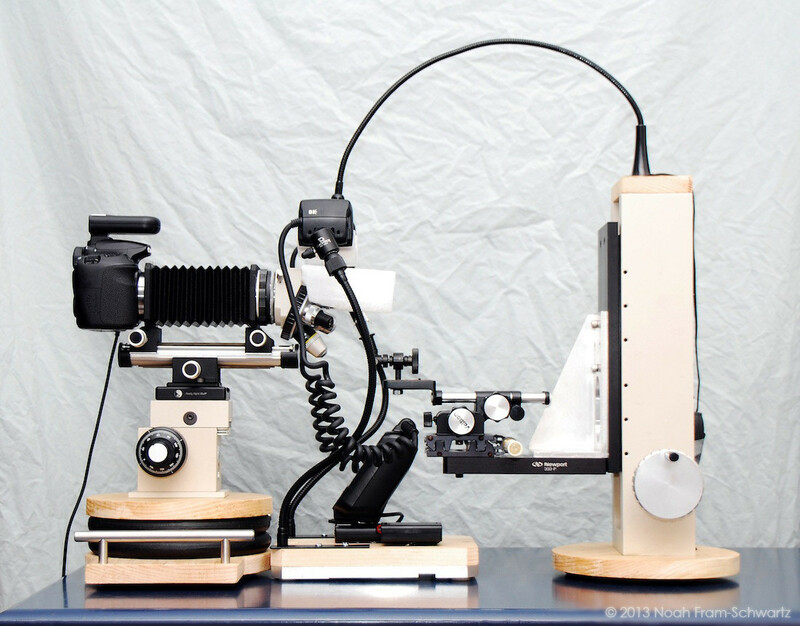 It's been a month or two since I posted the previous iteration of my rig (http://www.photomacrography.net/forum/viewtopic.php?t=18691) and since then I've made a number of significant changes. The rig in its entirety is made up of three components; the camera stand, flash stand, and subject stand, each of which I will cover below. I hope I've organized the following information in an easy to understand way but please let me know if something is unclear or if you have any questions. Initially, I was hesitant to attach the turret directly to the bellows, assuming it would making lighting the area around the objective very difficult. However, I decided to give it a shot and it turned out to be quite successful. I made the diffuser from a plastic bottle (cut to shape) sandwiched between two sheets of packaging foam. I then glued it the nosepiece base which slides right into the top of the turret. This way, I can very easily slip the diffuser in and out of place. 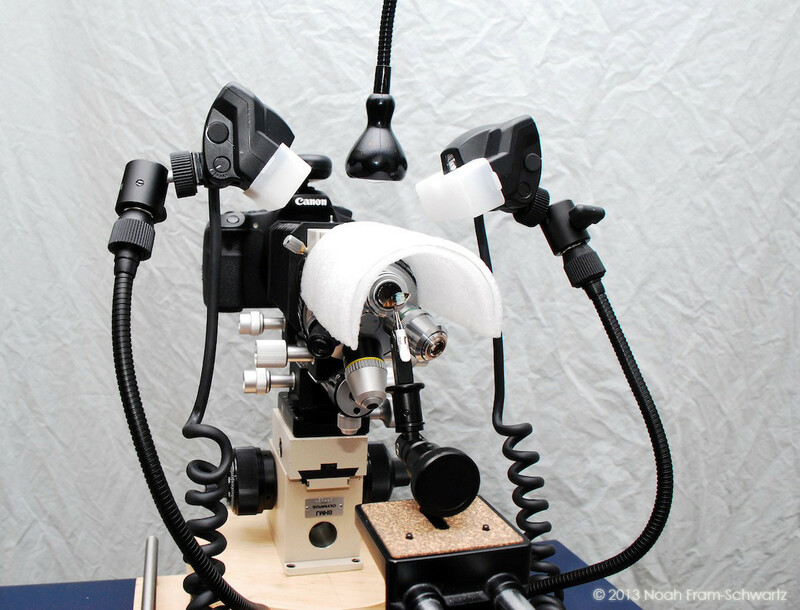 An RRS Arca-Swiss clamp is mounted directly atop the BHMJ Focus Block so that I can easily switch between the bellows unit with objective lenses and the MP-E65. 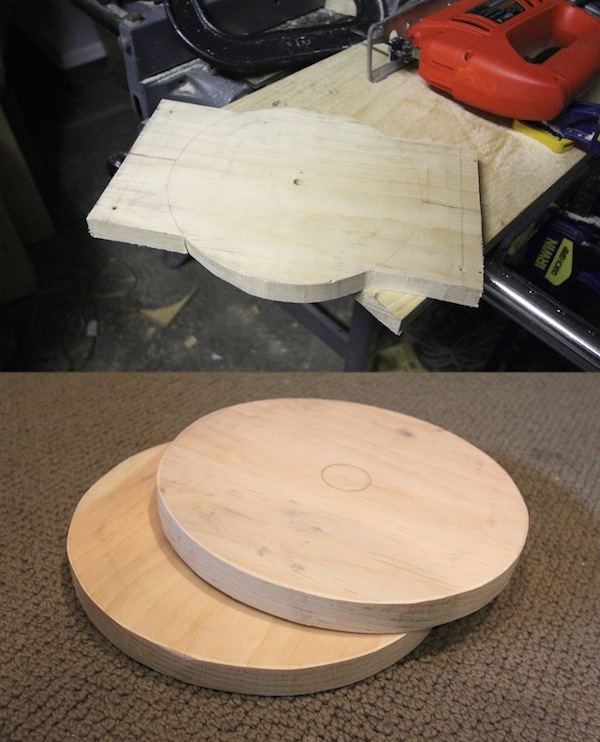 For the base, I sandwiched two 10lb weights between two pieces of wood. I then ran a bolt through the center and tightened it with a nut to keep it all together. This large amount of weight allows me to comfortably operate the rig at 40x (the maximum magnification objective I currently own). At first, I had the MT-24EX flash mounted directly in the camera's hot shoe but I then realized how much vibration this was causing and decided to build a separate stand for the flash and the goosenecks. To add some weight to it, I cut the wood to fit a piece of aluminum I had laying around then drilled a few holes and screwed them together. I then cut the bottom hot shoe (male) off a Yongnuo wireless flash trigger (see link at bottom of post) and soldered the wires of a AA battery box to the corresponding terminals in the wireless flash trigger. I did this so that I could epoxy the flash trigger to the wood base and still be able to change the batteries when necessary. The device I use to hold the subject is the Dino-Lite MS16C Specimen Holder. 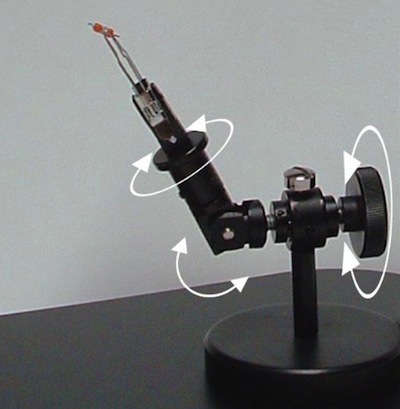 As the following photo (not mine) illustrates, the device allows for 3 degrees of motion. I highly recommend it to anyone looking for a subject holder. The setup as a whole is made up of more than 30 independently purchased items. Some of them were found on eBay, at a local junkyard, or on Amazon and some I made myself. If you're looking for any of the equipment shown above, here's a list of the items that I purchased on amazon for use in my rig. Wonderful rig, great build quality. I really like how you assembled this setup. Is the total weight of the turret and the objectives not too heavy for the bellow to hold? 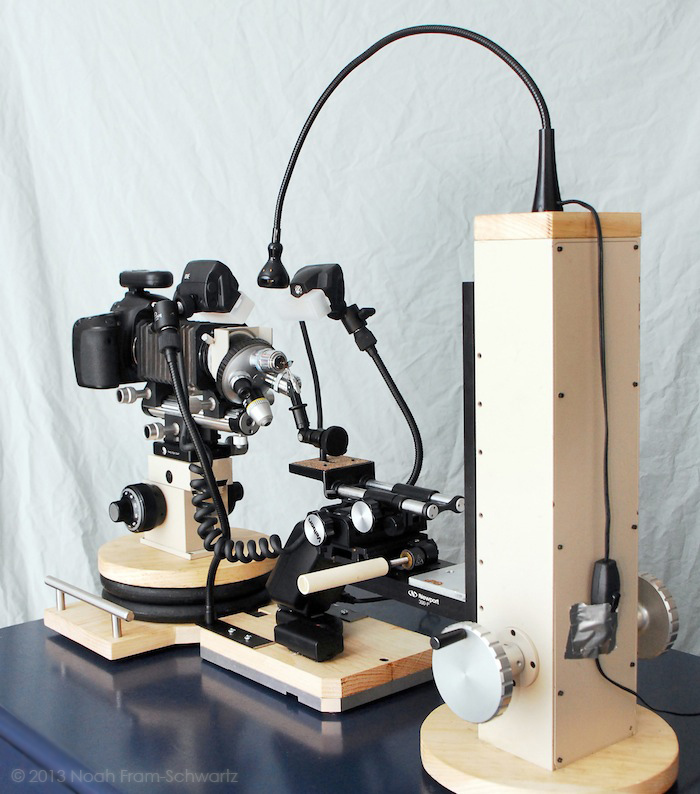 What brand/type microscope is the turret from. Noah, very interesting rig, I like it a lot. I love the microscope turret to easily change objectives. My only possible concern would be about the long arm holding the specimen: it may be vibration prone. or this flexible with clamp. Even after attaching the turret to the bellows, I'm still trying to streamline the rig even further. For example, I'm thinking of mounting the LED from an IKEA lamp to the center of the turret/nosepiece which doesn't rotate (see image below). Regarding the cantilevered arm, I haven't had any noticeable issues with it yet, though I do plan on adding a 10lb weight to the base of the subject stand just to add some extra stability. I actually own the first gooseneck you linked to and I agree that it is far too stiff for these purposes. The second one definitely looks much more flexible. Because you illuminate the subject with flash, you will have more immunity to vibration than an LED illuminated rig. 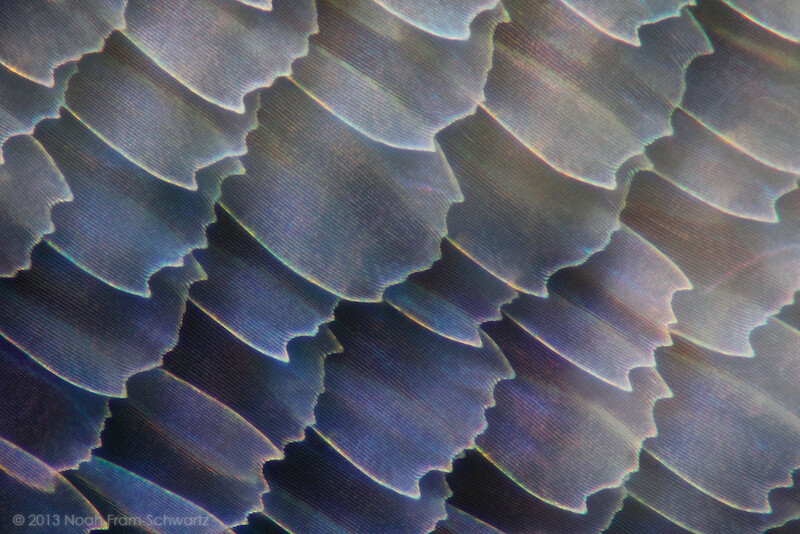 Where you might have trouble is if you do a high magnification stack and turn off the alignment options in the software. Some times I need to do this if there is a stray antenna that extends beyond the majority of the image. 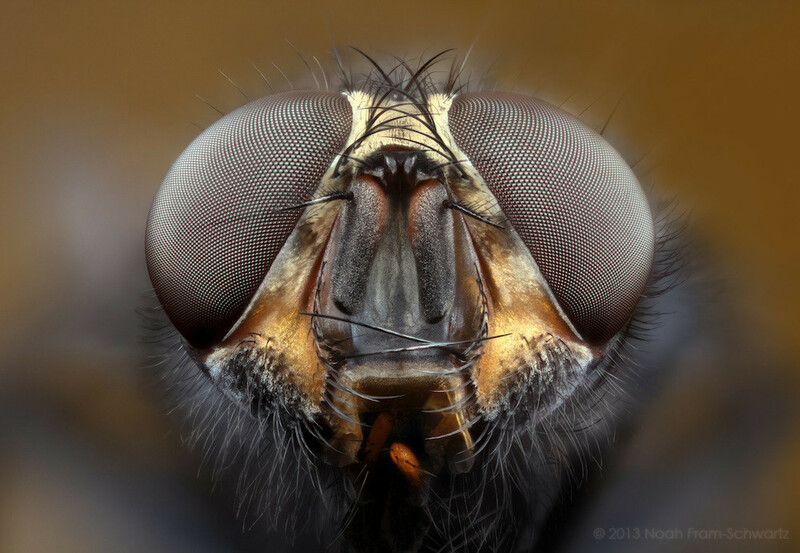 The software will occasionally follow the focused bit of the antenna, "aligning" the image to keep the focused bit centered. When this happens the stack drifts right or left and the antenna is shortened in the finished image. 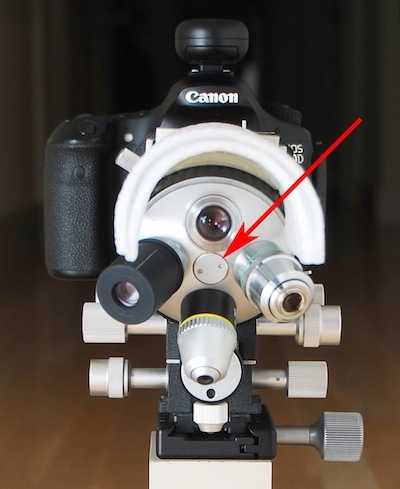 Since my actuator runs quite true, I can usually suppress alignment without impact to my 10X or 20X images. If the subject is vibrating, even if the flash freezes the image in an individual frame, the images may be slightly misaligned by scatter created by vibration. Your rig looks excellent and your construction robust. I am sure you will get great pleasure/results from your images. Keep up the good work! Nice rig - I just came across it and I think it's great that you've mounted a turret to your rig. I'm working on doing the same with mine, but my turret is pretty heavy so I'm not sure if it's a good idea in my case. We'll see! At any rate, the specimen holder you've mentioned here looks interesting. I'll likely give it a try. Posted: Sun Feb 10, 2013 12:05 pm Post subject: Love your setup! I'm trying to reduce camera shake in my current setup and your solution to reduce camera shake may be adaptable to what I'm trying to achieve. Thanks for posting. Thanks for the information regarding the Dino-Lite MS16C Specimen Holder. I was in the process of sketching a specimen holder appropriate to my requirements and after doing so recalled this thread and purchased the MS16C. I've had trouble with the software erroneously aligning images, though my rig does sometimes shift the frame ever so slightly between shots during a stack so I imagine turning off XY alignment may be more harmful than helpful. Having the integrated turret certainly speeds up the whole process. I highly recommend it. 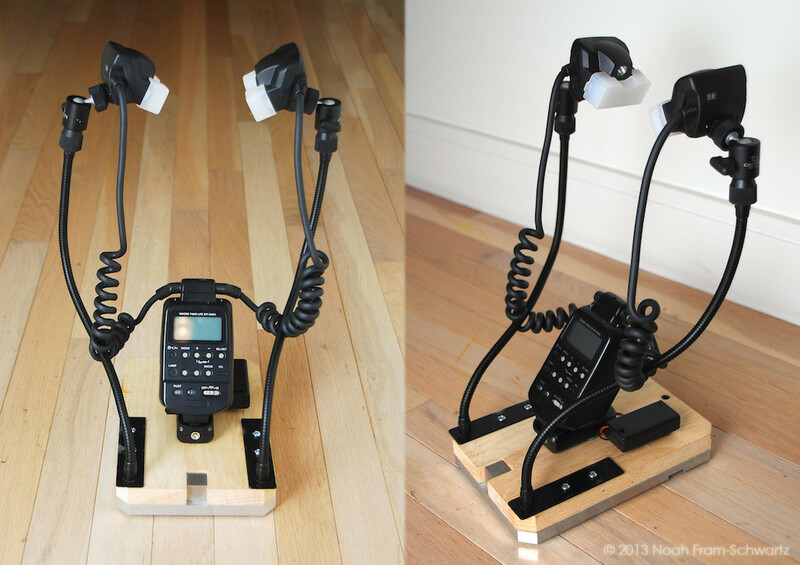 I cannot stress enough the difference in vibrations before the addition of the "flash stand" and after. Having all of that weight mounted above the camera was certainly the biggest contributor to vibration in my rig. Adding the two Barbell disk weights also made a noticeable impact. I often see Sorbothane feet mentioned here on the forums as the panacea for all vibration issues. However, I've found that if the feet are mounted on independent stands (like the stands in my setup), their Jello-like nature makes it easy to shift the whole stand just by turning the coarse focus knob on the focus block. 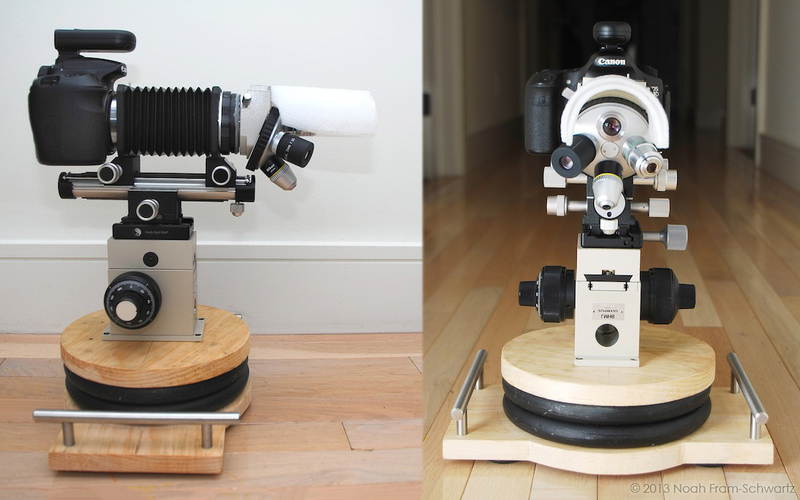 If however, the stands (in my case the camera, flash, and subject stand) are all mounted on some collective base, such as an optical breadboard, putting the Sorbothane feet on the breadboard would be very effective in isolating the rig from the surrounding environment. I was recently working with my rig on the fifth floor of a building in NYC that had a subway running directly underneath; not exactly the ideal scenario for high magnification stacks. At 40x, the frame was shifting very noticeably without touching the rig or even breathing on it. I'm wondering if attaching the feet would help suppress this vibration (to a noticeable degree) even though the vibration is constant. 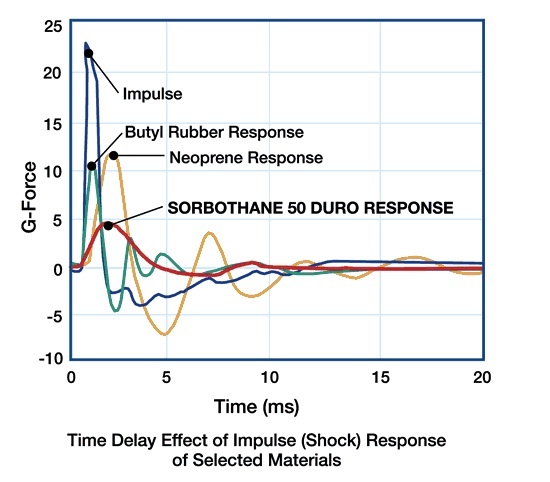 See the graph below for more info on the effectiveness of Sorbothane. The DL MS16C was certainly worth it. 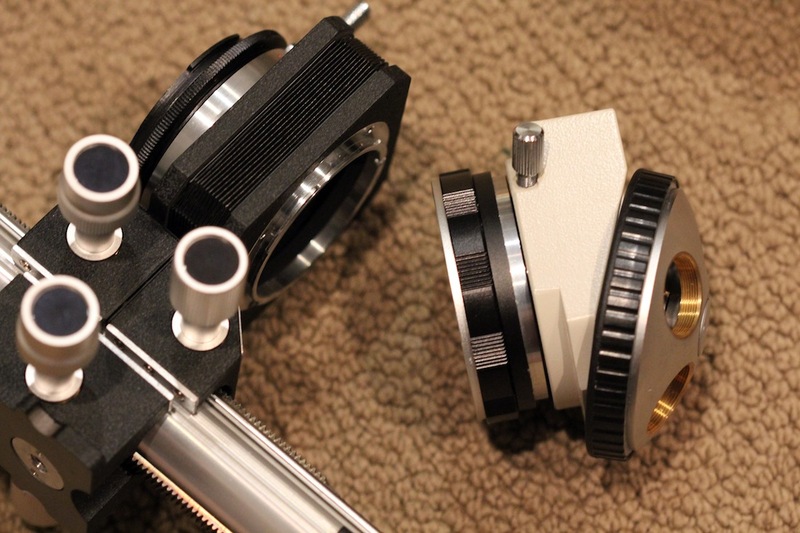 At about $70, it is significantly cheaper than common alternatives (as you know, high quality 2 axis goniometers and a rotation stage are usually at least $400). To anyone else currently looking for a good subject manipulator, I'd highly recommend the DL MS16C. 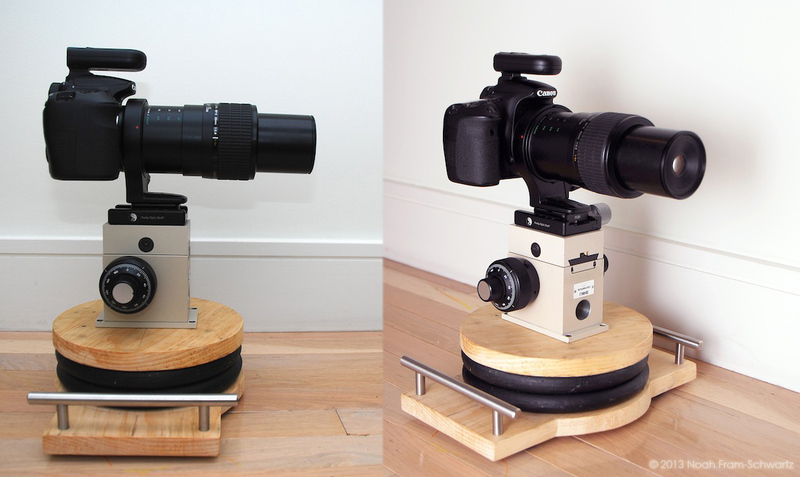 If however, the stands (in my case the camera, flash, and subject stand) are all mounted on some collective base, such as an optical breadboard, putting the Sorbothane feet on the breadboard would be very effective in isolating the rig from the surrounding environment. I've found the Sorbothane 'feet' to be more effective at isolating vibrations than the bumpers (hemispheres). The 1/4-20 thread screws into the base of my optical breadboard and also provides some minor 'levelling' capabilities. Thanks from me also Craig - hope you are on commission from this seller! - for the pictures you show here, you talk about an increment of 0.01mm. Does that mean that you physically move the camera towards the subject with steps of 0.01mm. I wonder: what does give you that precision ? Is the focus block ?